This Cherry Blossom Tree - Peel N Stick Dorm Decor college decorating accessory is a dorm room decoration fit for a princess. After all, cherry blossoms were planted all over ancient Asian royal palace gardens. 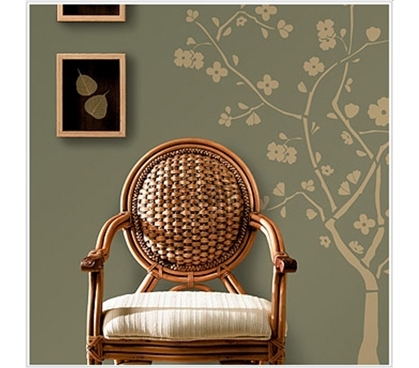 Now, you can enjoy the same peaceful beautiful with this Cherry Blossom Tree - Peel N Stick Dorm Decor. This Cherry Blossom Tree - Peel N Stick Dorm Decor is however, a much easier way to have a gorgeous tree in your dorm room. You don't even have to water it! This Cherry Blossom Tree - Peel N Stick Dorm Decor makes a great dorm gift for college students because it's dorm safe decoration that any college girl will appreciate as a dorm room decorating idea. Peel N' Stick products peel off and stick on with ease, and are better alternatives to college decorations that require sticky tape or tacks.